Well at least physically I’m leaving, saying goodbye to this most amazing food city, but I have so much more to share with you about this trip, you’ll be hearing about for weeks to come! To sum it up: The Bay area has the best food, produce and restaurants in the world (Or at least I think so). How’s that for grandiose? In large part that is because local, sustainable and organic are a given and everyone from the Thai take out place to the Mexican taqueria in the Mission to upscale places like Zuni cafe all know the importance of quality ingredients. In New York a growing number of restaurants are on board with this, but here in San Francisco it seems like practically every restaurant is striving for this standard, in NYC it’s a handful. Of course here in the land of diversity and plenty where outstanding produce from Oranges to Tomatillos are readily available it makes it a little easier. Still it hard not to be bowl over by what it on offer on every corner. Per capita it seems to me, at this giddy moment, that there are more, affordable, quality restaurants in San Francisco then anywhere else I have ever been, including New York. One of the early san Francisco restaurants to garner national attention (and indeed international attention ) was Zuni Cafe. Their wood oven roasted chickens are things of legend. 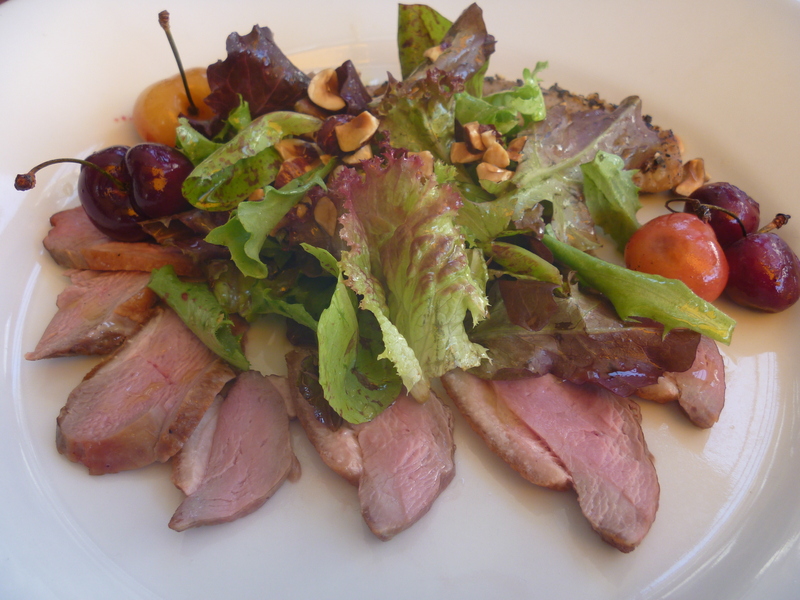 I had duck, which wasn’t exactly legendary, but it sure was good, served with roasted cherries (local, two different kinds). Other then Chez Panisse, Zuni was the only place I had planned to eat, even though in truth was a very casual plan, I just showed up one day when I was hungary and hoped they’d have room for me at lunch. The room is actually rooms, a ramshackle affair borne out of a restaurant that evolved and grew over time and was lucky enough to be able to grow within the same building. Airy and causal, with unfailingly friendly staff you’d never know this was a famous place. As good as the duck was the polenta with parmesan and Marscarpone was better! Given that this is my self-imposed Summer of Starvation I did not have desert, but seeing as how looking at the desert menu is free (calorie free!) I gave it a glance. 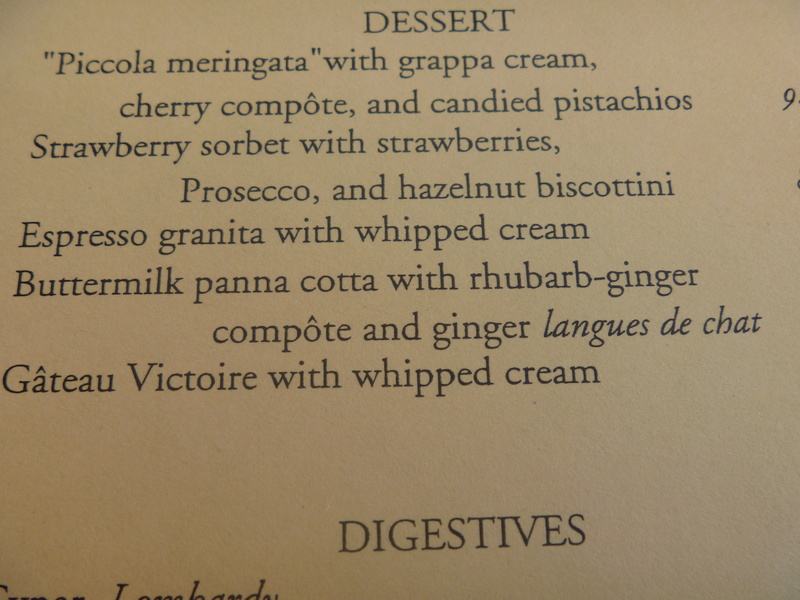 If you look down the list you will see a Panna Cotta served with a rhubarb ginger compote! Now what have I been say lately about that combination? I feel vindicated. San Francisco was on the cutting edge of the seasonal/local/sustainable movement it was delightful to be able to visit one of the early pioneers, and heartening to see that after all these years they are still going strong. Between the visionary inspiration of several early restauranteurs and the unique ecosystem that gives Northern California some of the best produce on the planet it is now wonder that on every corner something tempting lurks. 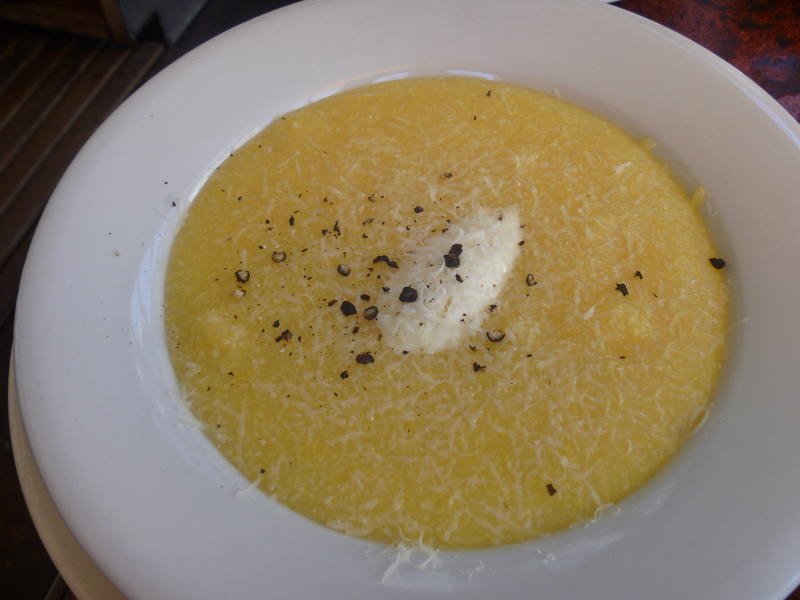 This entry was posted in Travel and tagged Chez Panisse, Eating out, San Francisco, Zuni Cafe. Bookmark the permalink.